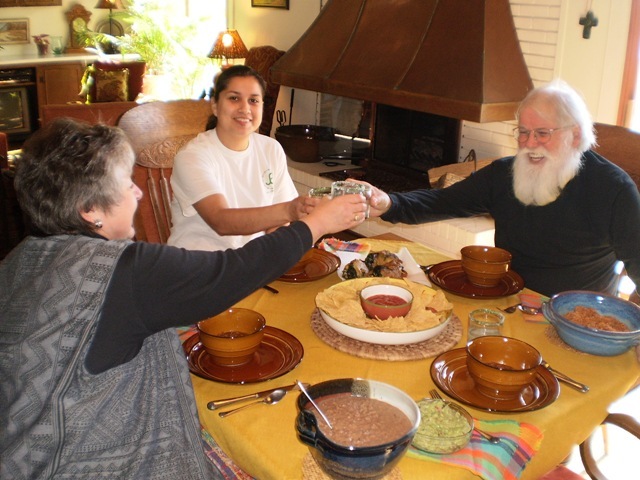 Mike Goree, known throughout these parts as Santa Claus, and his wife Johanna, were having a farewell lunch for their friend Ana Cerda , a native of Coahuila, Mexico. To set the stage, Linda Ronstadt was singing Mexican tunes on the stereo. 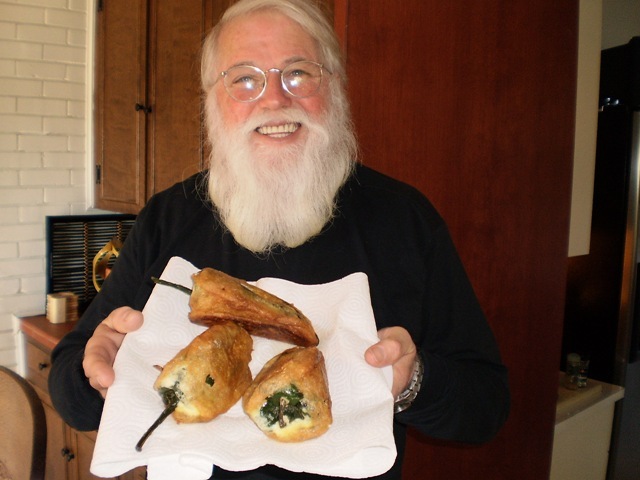 In case you hadn’t noticed, Mike bears an uncanny resemblance to the Jolly Ole Elf and he is called upon repeatedly to play the part in Christmas parades, parties and retail promotions throughout the region. This is fitting since he is a marketing professor at Mississippi State University in his other life. 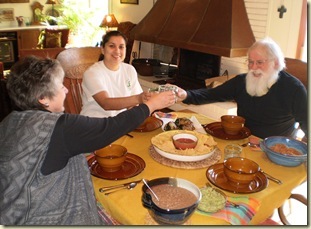 The Gorees were pretty clever because they persuaded Ana to prepare the lunch – which she did with glee. (If you’re Santa you can get away with that stuff.) 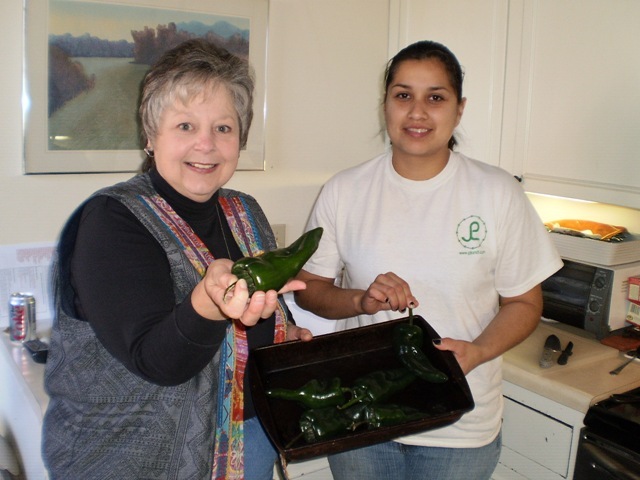 On this occasion, she prepared Chilies Rellenos (or is it Chiles Rellenos?) along with South of the Border rice, beans, and chili. 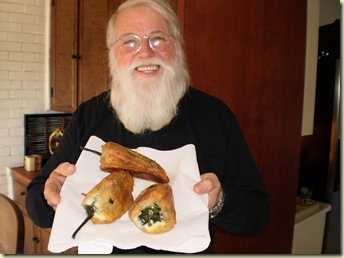 Actually, the Gorees prepared the chili and I was shocked when Santa admitted it contained venison. You know what I was thinking. I demanded to visit the barn so I could make sure Rudolph and his compatriots were in the stall, alive and well. They were. Anyway, I love Mexican cuisine, but can’t say I’ve ever had it prepared by an authentic Mexican cook. In fact, the Mexican food I’ve had doesn’t come close to Ana’s. Johanna and I turned preparation into a sort of cooking school so we can carry on when Ana departs for Texas where she will be living. We took copious notes and discussed every step – and let me tell you there were so many steps I got lost several times. 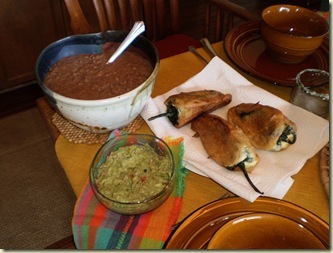 Ana made two kinds of rellenos – one stuffed with cheese and the other with a beef filling. 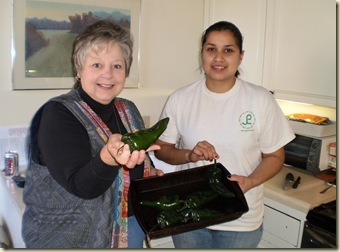 Johanna had prepared a delicious guacamole and a pitcher of Margaritas. Dessert was chocolate bars flavored with chili peppers. You can buy them locally as Lindt bars and let me tell you, they are already on my grocery list. 1. 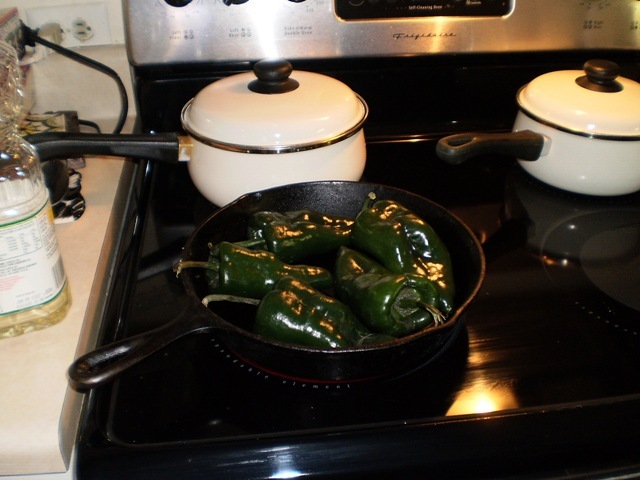 Go to the grocery store and buy the biggest Poblano (or Ancho) peppers you can find. 2. 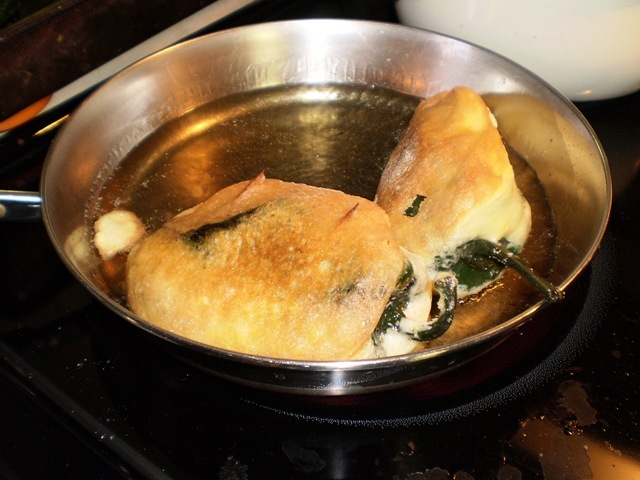 Place them in a black iron skillet (or you can grill them) until they are blistered and chared on all sides. 3. Peel the blackened outer skin and discard. 4. For cheese chilies:Cut a slit in one side and stuff with slices of your favorite cheese. For beef stuffing, you mix browned hamburger meat with chopped onion and garlic. 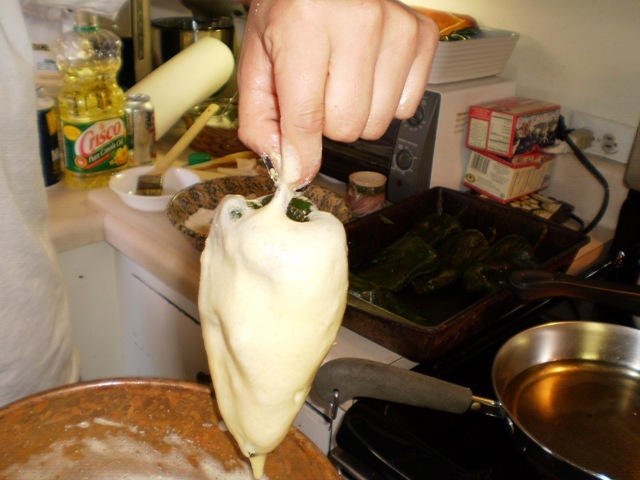 She added a healthy dose of oregano and cumen and two heaping tablespoons of Masa dissolved in a quarter cup of water. Masa is a thickener made of corn flour which we says may be purchased at WalMart. She also added a big spoon full of Caldo de Tomato which I’ve got to go find. It’s like dried tomatoes mixed with other goodies. It will become a staple in my pantry. 5. Separate three eggs – beating the whites until stiff peaks form. Add the egg yolks and mix just until blended. 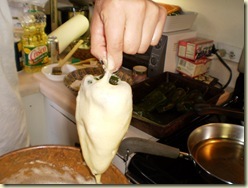 This is the batter into which you dip the stuffed peppers. 6. 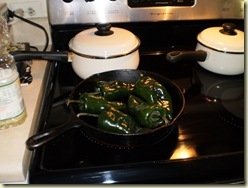 Drop the battered peppers into hot oil and brown on all sides. Serve up as soon as possible. Unbelievably beautiful and tastee beyond what I’ve ever experienced.